Rested after his last start victory in the Queen Elizabeth II Cup in October, DEBT COLLECTOR served up a thriller in his seasonal debut at Kranji here today. 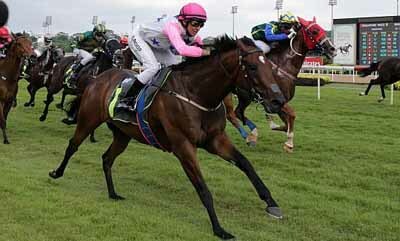 Giving weight to the majority of his opposition today, the Thorn Park gelding staged a dramatic from last-to-first performance in the Class 1 - 1400m handicap. DEBT COLLECTOR was still second last at the home turn but picked up the leaders one by one in the home stretch to win by a neck for his 11th win in 22 starts. "This horse means the world to me. He is a dream to train," said trainer Cliff Brown. "He’s just remarkable. He’s come back bigger and stronger and he did it with 59kgs on his back first-up." "We were probably further back than I would have wanted. I could have been closer earlier by going on the fence, but I switched to the outside instead," said winning jockey Michael Rodd. DEBT COLLECTOR won five Group races in 2016 including the Group 1 Singapore Guineas, Kranji Mile and Raffles Cup and was named Singapore's Horse Of The Year that year.